A friendly global challenge was issued this year: Which cities could engage the most people to record the most observations of wildlife and plants, and find the most species over 4 days, April 27-30? There were 68 cities worldwide who answered the call. These cities tallied 441,888 observations by 17,329 people. Of these, 63 cities used iNaturalist resulting in 423,845 observations of 18,116 species by 16,544 people. The free iNaturalist app is now the standard way for bioblitzes and other citizen science (the involvement of the general public in scientific research and data collection) projects to record information. The beauty of the app is that with a simple uploaded photo, crowd sourcing can then help identify the organism and the observation is recorded so that worldwide any researchers can data mine the info they need. You never know what piece of data you could be providing some researcher somewhere in the world. You don't even need to know what you're reporting (though the iNaturalist app has a neat suggested identification feature to provide likely ID possibilities) due to the crowd sourcing that allows other perhaps more knowledgeable people to provide their ID skills. Its 22,809 observations was 5th place overall, behind San Francisco which started the competition 3 years ago (41,737 observations), Dallas/Fort Worth (34,218 observations), San Diego (33,448 observations), and Klang Valley/Greater Kuala Lumpur (25,287 observations). Just behind DC were Houston followed by New York. Coming in last was Palmer Station Antarctica which understandably only had 36 observations (but 27 species with only 3 people in Antarctica of all places! ), just behind Buenos Aires (170 observations of 96 species with 18 people) and El Salvador with 220 observations of 52 species using only 6 people. Globally 124 new species were added to the iNaturalist data base that had not been present before, with Hong Kong providing 57 of them. As far as participation, the DC region again did wonderfully! It came in 4th place overall with 876 participants who made observations. This was behind San Francisco (1,532 observers), San Diego County (1211 observers), Boston (992 observers), and just ahead of Los Angeles (which also started the competition 3 years ago with San Francisco, with 855 observers). With over 40 planned DC regional events over the competition period, it turned out those group events really paid off. The DC Metro Area also did remarkably well with its species count, considering some tropical places have much more biodiversity. The DC Metro Area came in 8th overall with 1,855 species observed. Arlington had a good showing overall as well for the DC region it was included in. Of the over 40 DC Metro Area planned events, Arlington led or had a leading partner role in 25 of them. Within Arlington County itself, 134 observers tallied 3,957 observations and identified 644 species. The top observed species for Arlington were the American Robin (reported 46 times) and Virginia Creeper (reported 46 times). Some unusual sightings will need to be investigated and verified as they might prove to be very interesting. While some are positive, the observations of potential new invasive plants are also important to know about, and a few were indeed reported. Overall, a very respectable showing and demonstration of Arlington’s commitment to citizen science. 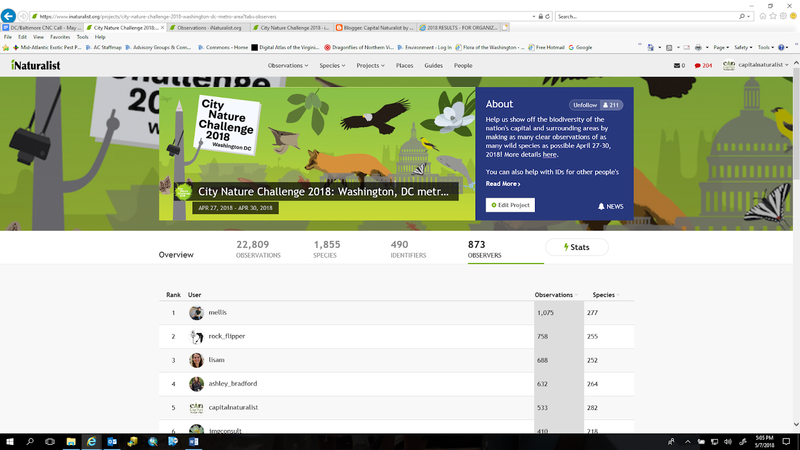 This City Nature Challenge proved to be a fun and friendly competition that did show that the DC area has great diversity and interest in citizen science. While it will take a while to digest what these nature observations will add up to as far as research contributions, the overall interest and caring of the environmental community was front stage on a worldwide scale. This event was also a great dry run and warm up for Arlington’s BioBlitz scheduled for Saturday, September 15th, 2018. Hoping it can be great event with lots of participation and observations as well. So mark your calendars now so you can participate! As for next year's City Nature Challenge, we will hopefully learn more about that date soon so we can gear up and do even better next time around! 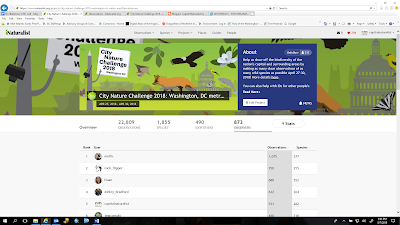 On a personal note, the Capital Naturalist was proud to be a City Nature Challenge partner and to have led multiple events in the DC Metro Area. I’m even prouder to have had a good showing overall, with my 533 observations putting me in 5th place on the DC area leaderboard overall, and my 282 species identified placing me in first place in that category for the region. better yet, it allowed me ample opportunities to be outdoors with like-minded people having fun making nature discoveries. What's not to like about that? So here's to citizen science, future bioblitzes, City Nature Challenges, and all the other ways to make fun nature discoveries in our wonderfully diverse region! Thanks for sharing this amazing information.i am waiting for the competition and mark my calendars now so i can participate. I enjoyed participating in my first bioblitz in Arlington back in September 2018 and I was there when a board was lifted and an adorable Ringnecked snake was spotted. I got to this cute little fellow. Can't wait till the next one in April.